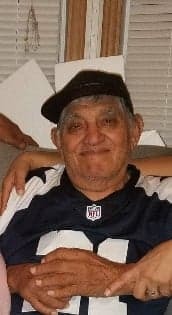 Andres Gallegos Jr, 77, was called by the Lord on September 12, 2018. He was preceded in death by his parents: Andres and Teresa Gallegos; brother, Arturo Gallegos; sisters: Gloria Parra and Audelia Luna. Left to cherish his memory is his wife, Francisca Gallegos, son, Jose Pedro (Josefina) Gallegos, daughters: Maria Celia Gallegos, Rosa Maria Gallegos, 12 grandchildren, 11 great grandchildren, sister, Margarita (Romualdo) Parra, nephews, nieces, other family and friends. A visitation will be held on Saturday, September 15, 2018, from 6:30 a.m. to 8:00 a.m. at Gamez & Sons Funeral and Cremation Services where a procession will depart at 8:00 a.m. to San Luis Rey Catholic Church where a funeral mass will be celebrated at 8:30 a.m. A cremation will be held at a later date.